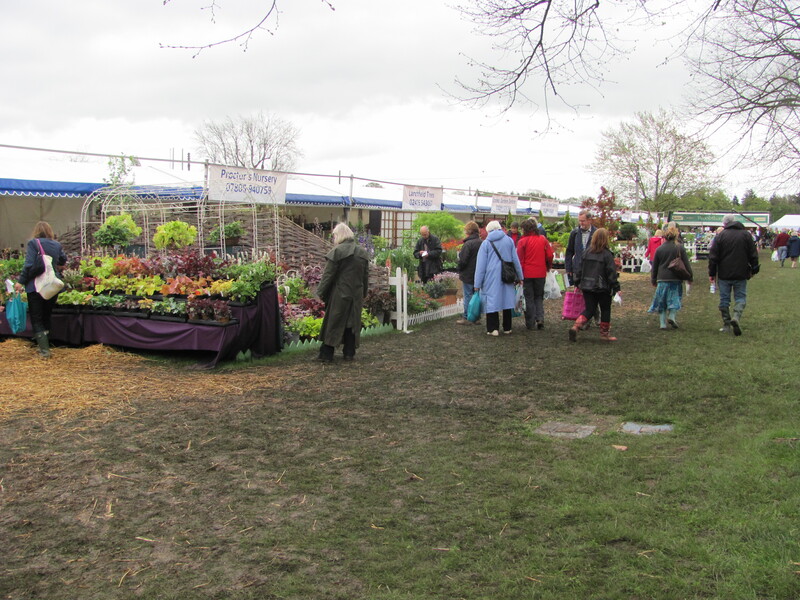 We had a great day out at the RHS Spring Gardening Show at Malvern but we did wonder why it was called a “Spring” show, as on the day of our excursion it felt far from spring-like. Drizzle, strong bursts of cold wind and very little in the way of sunshine. As we wandered around dark threatening clouds rumbled over dark threatening hills. Underfoot the effects of the recent relentless rain could be felt. The paths got muddier and muddier as the day wore on and the groundsmen raced to put down straw and bark chip.They were just about winning the battle. Shoppers looking out for unusual and special plants in the rows of nursery stands braved the mud underfoot and filled bags and boxes with their booty. 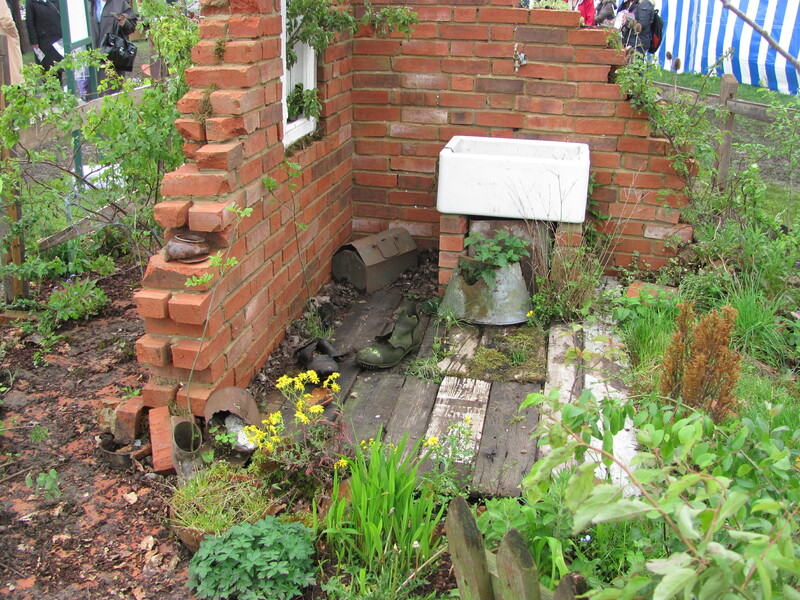 We were disappointed with the show gardens – we only liked parts of each one. 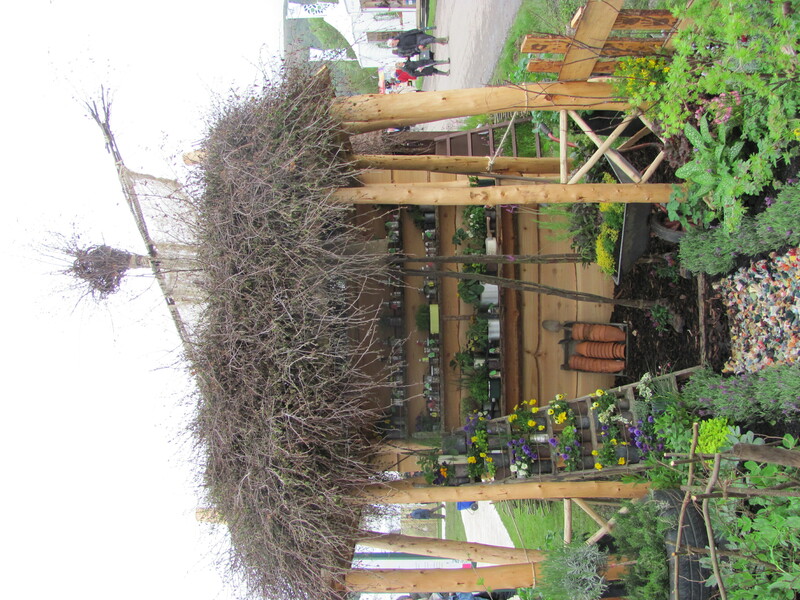 The team responsible for the garden which was awarded the much-coveted “Best in Show” card sat at the back of their garden surrounded by empty champagne bottles and looked absolutely exhausted. We could only guess at what time they had finished their build, probably at some hour in the early morning. 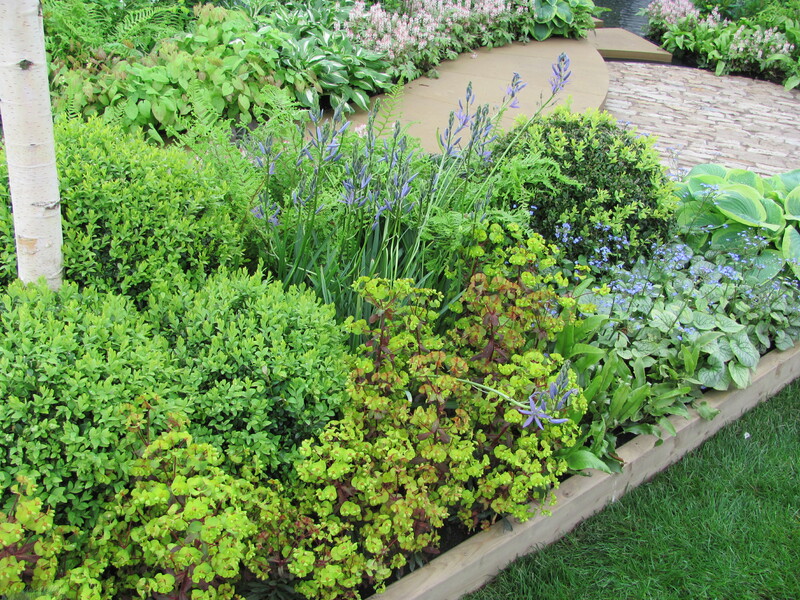 The planting in their garden was lush and densely packed in displaying the true spirit of the spring garden. 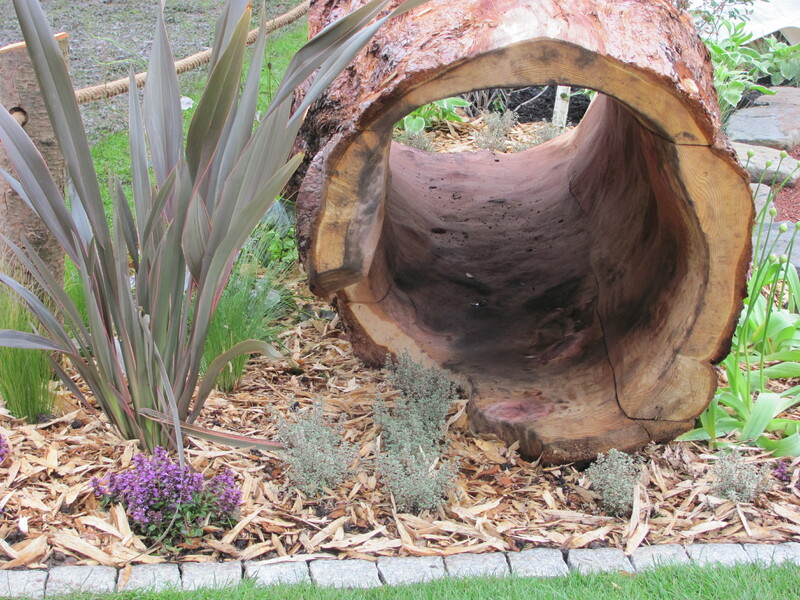 In other show gardens there were ideas to glean – the fire pit with wooden poles, the pink-painted sticks, beautifully planted original pots and a hollowed out tree trunk as a seat. 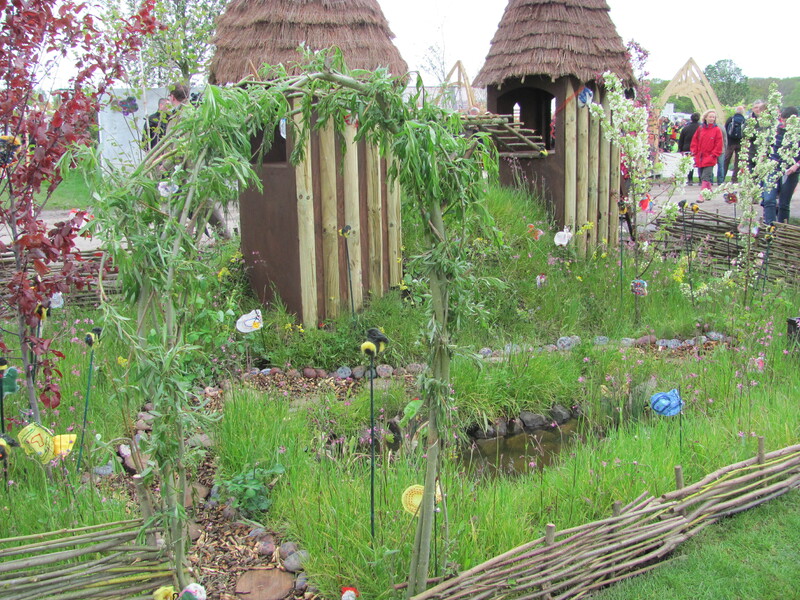 However the smaller gardens designed and built by school children were so impressive. 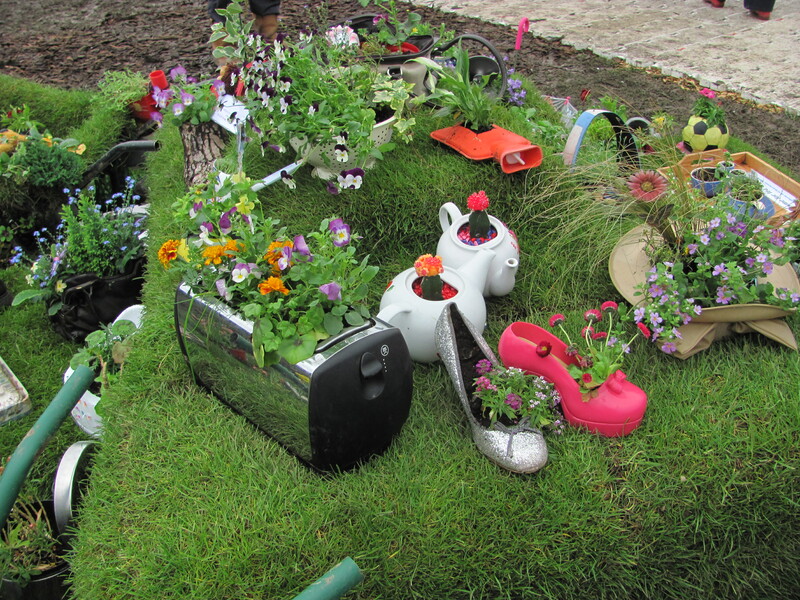 We spoke to the youngsters who had created these gardens based on the theme “Sustainability for All”, and were so impressed with their knowledge and skills of communication. This garden called “Yesterday’s Garden” was based on the post-war era when gardens were designed to provide food. Wildlife was welcomed in this garden. 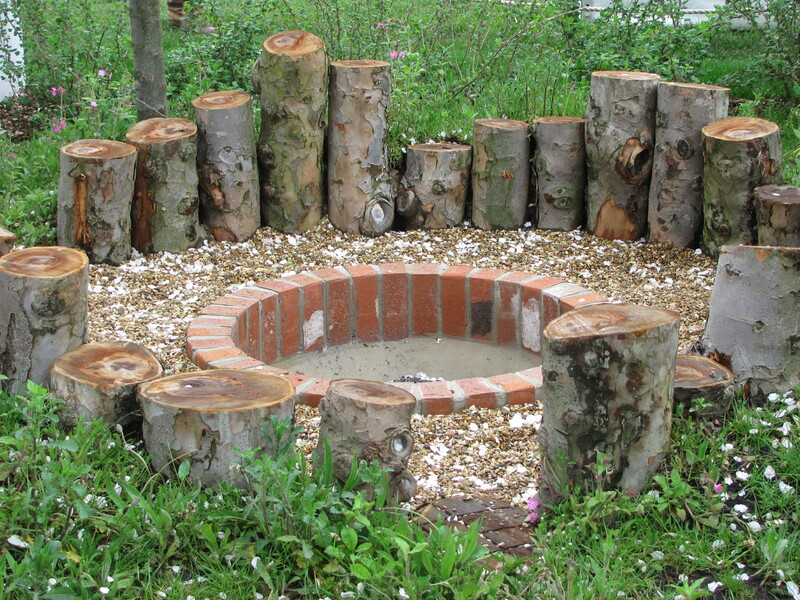 The pupils who created this unusual garden looked at how nature reclaimed places abandoned by man. 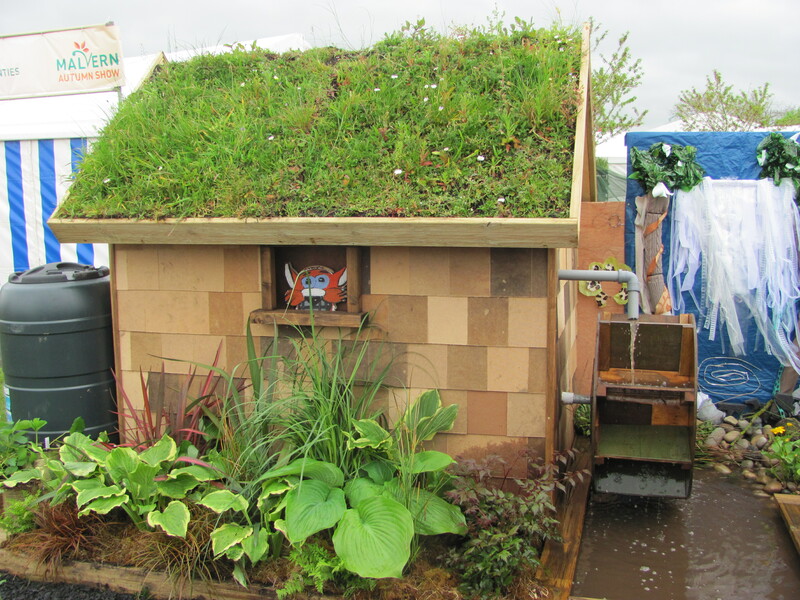 The following garden was designed and created by pupils from a middle school and featured this green roof on a shed which the pupils also built. 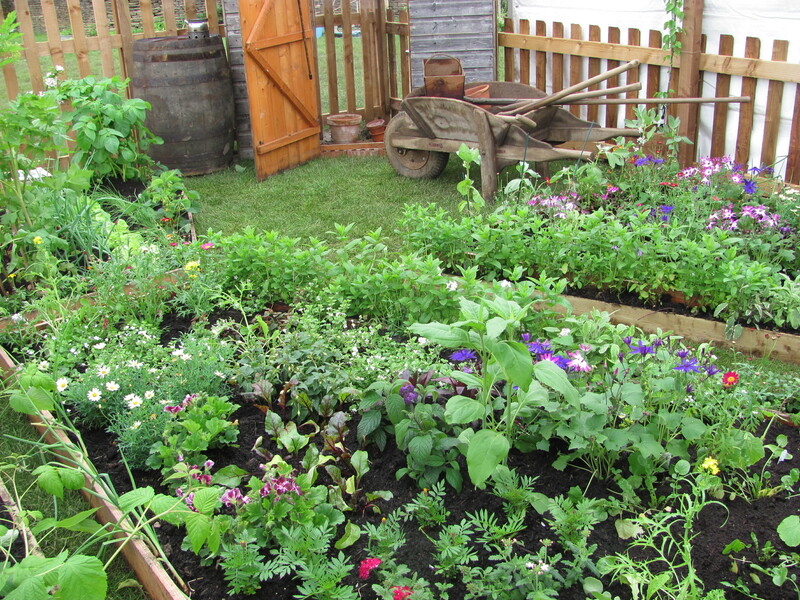 There was a vegetable plot and other borders contained plants chosen to attract wildlife. 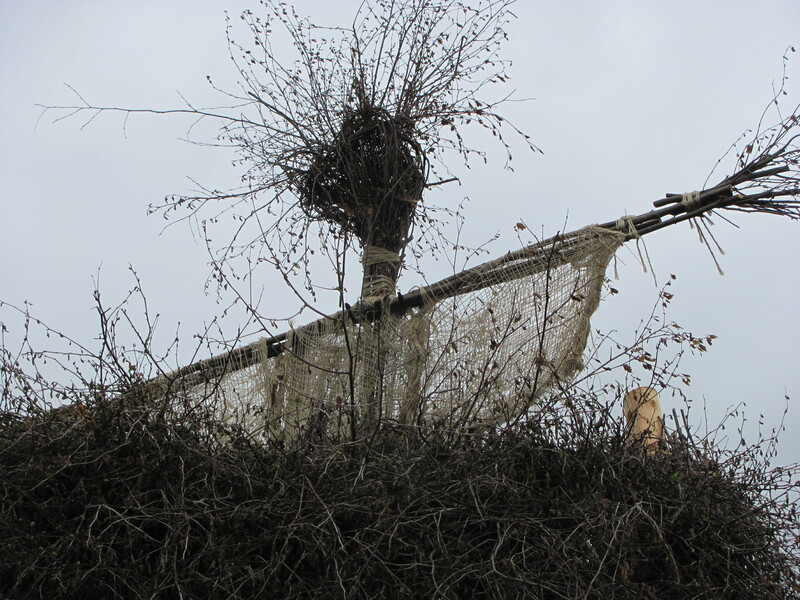 On top of the shed in this garden was a stick scarecrow looking down admiring the planting. Recycling was paramount in the minds of many of the young designers. 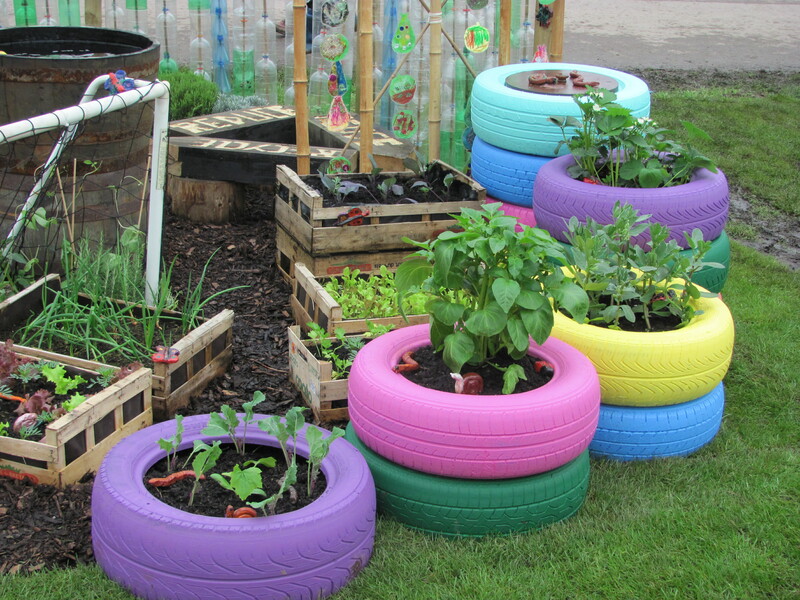 Here raised beds are made from old tyres and the far tower of tyres is a composter. 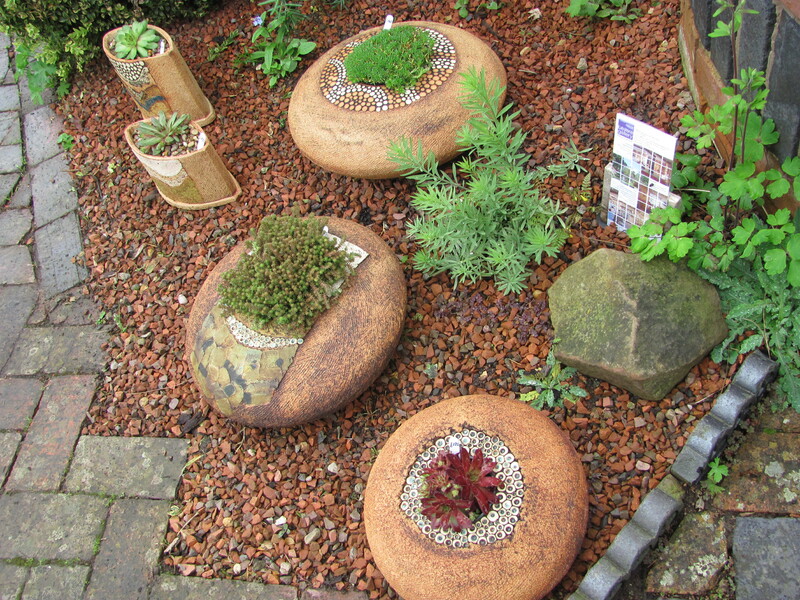 One group of pupils challenges other local schools to find recycled materials to use as planters. 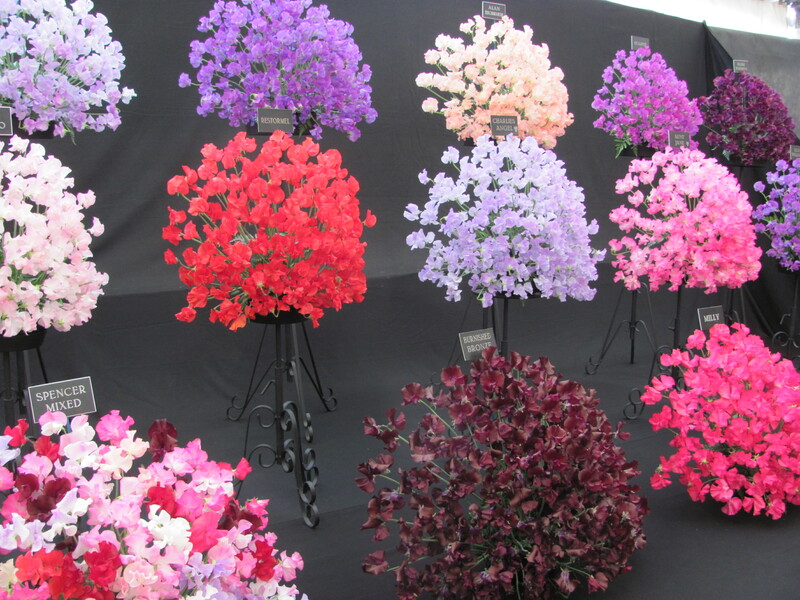 As soon as we entered the floral marquee the senses were aroused, scents, sights and sounds, and we turned into two kids in a candy shop. 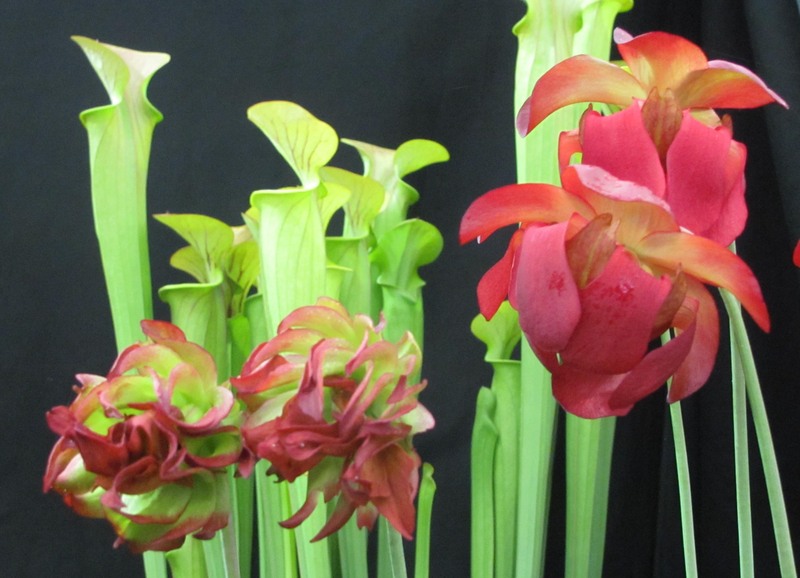 Familiar nurseries displayed their wares alongside excited but nervous new-comers but every one was special in its own way. 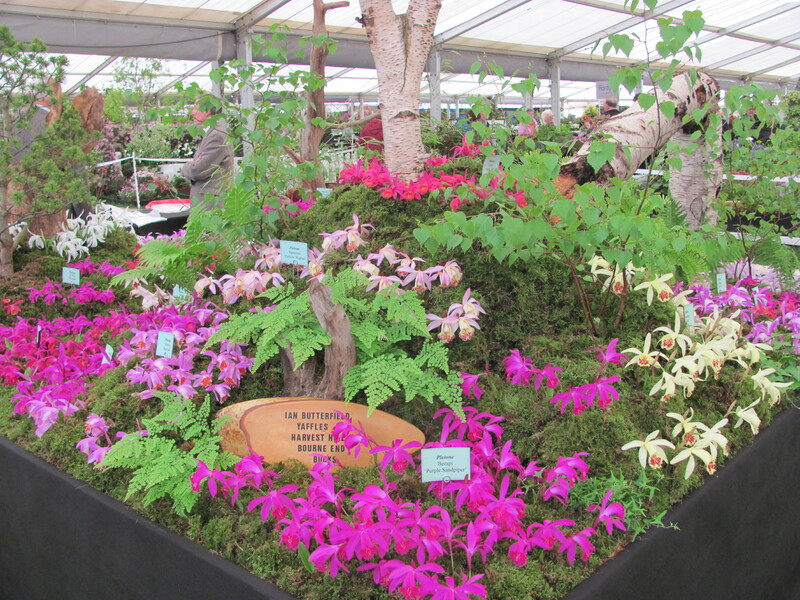 We were particularly taken with the acers, meconopsis, hostas, orchids, sweetpeas and insect-eating plant displays. 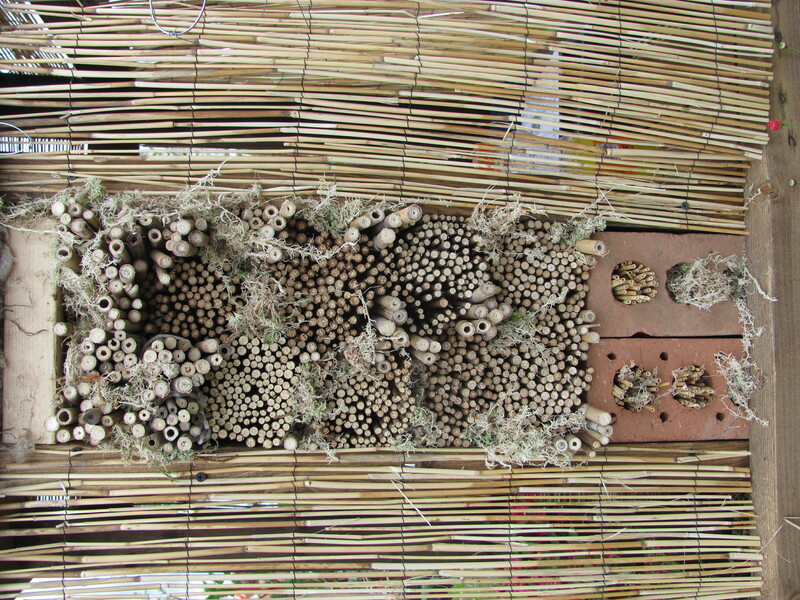 As usual we were on the search for new ideas for attracting wildlife to our garden and allotment – we were not to be disappointed. 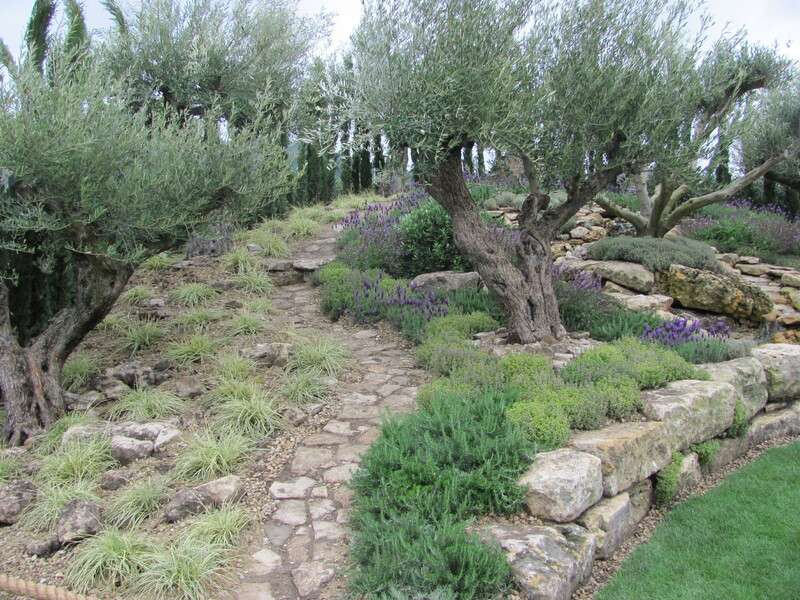 One garden that seemed to be defying the wet weather was based on a dry hillside dotted with ancient olive trees and lavenders. 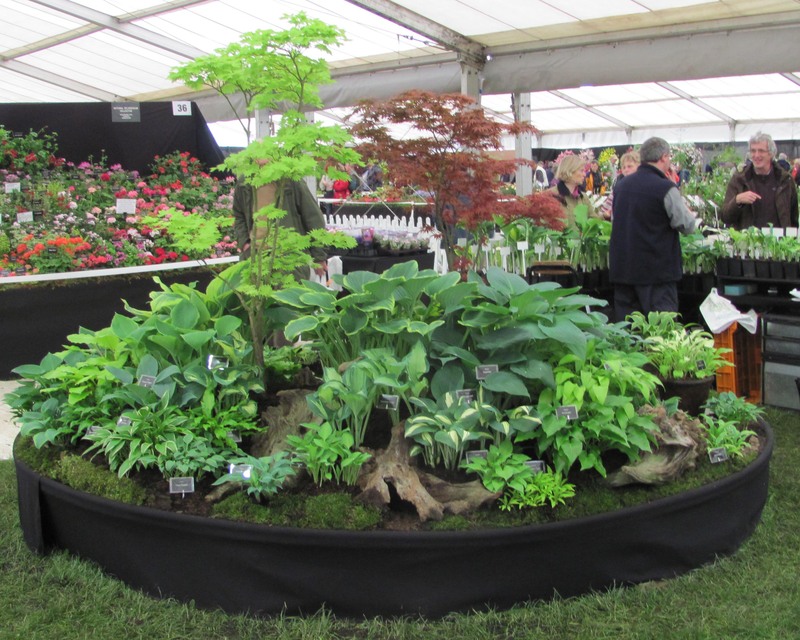 In my next blog we return to our day at the RHS Malvern Spring Show and look at patterns we found in plants and in gardening sundries. 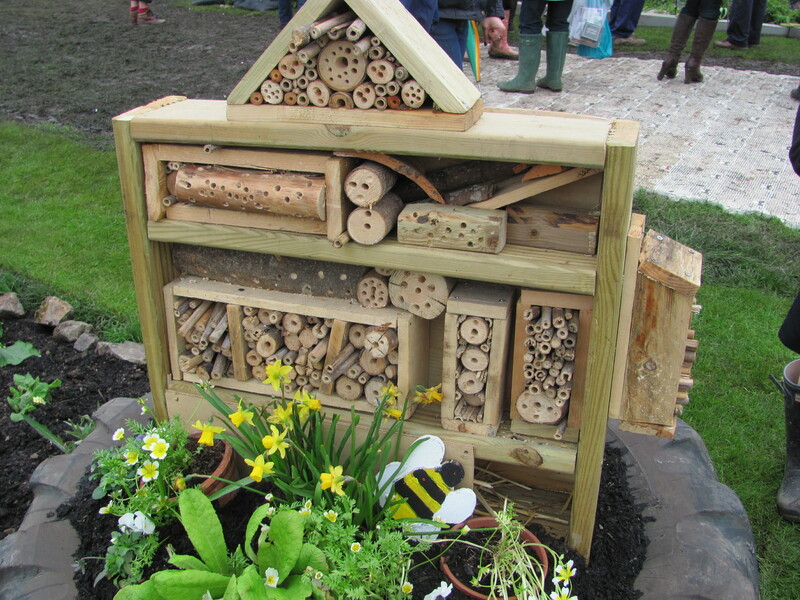 This entry was posted in fruit and veg, garden design, garden wildlife, gardening, RHS and tagged conservation, fruit and vegetable growing, garden wildlife, gardening, insects, Malvern Show, RHS. Bookmark the permalink. Wow! What a day you had. And, thank you for so many great ideas. My head is spinning. 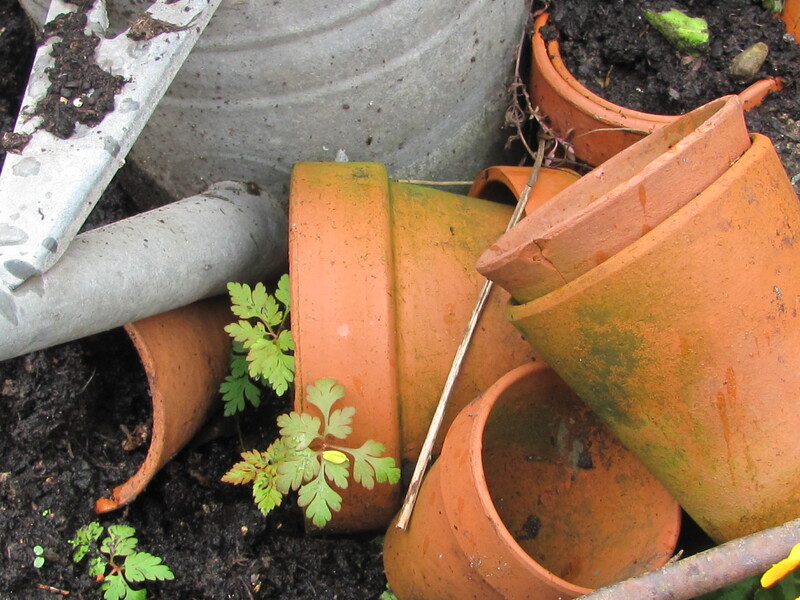 I thoroughly enjoyed the garden show with you but in the comfort of my dry and warm home. Thanks for sharing your photos. It is a real pleasure to share photos – it gives them more meaning. Loved the students gardens and ideas for recycling. 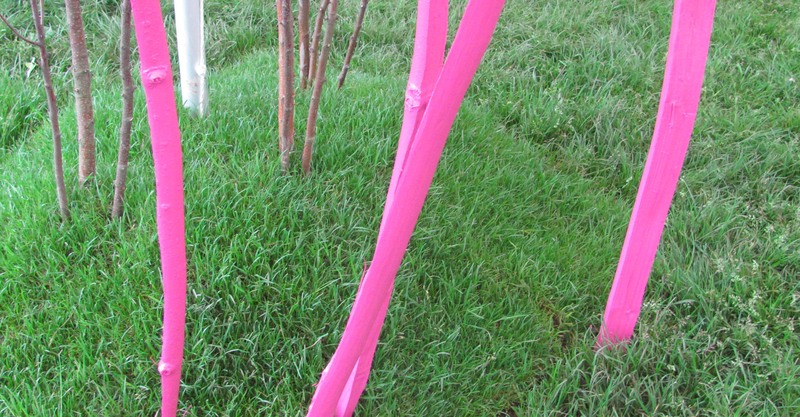 Really need to start decorating tyres and creating more beds. The students were inspiring and so were their gardens. What a fun day you must have had. 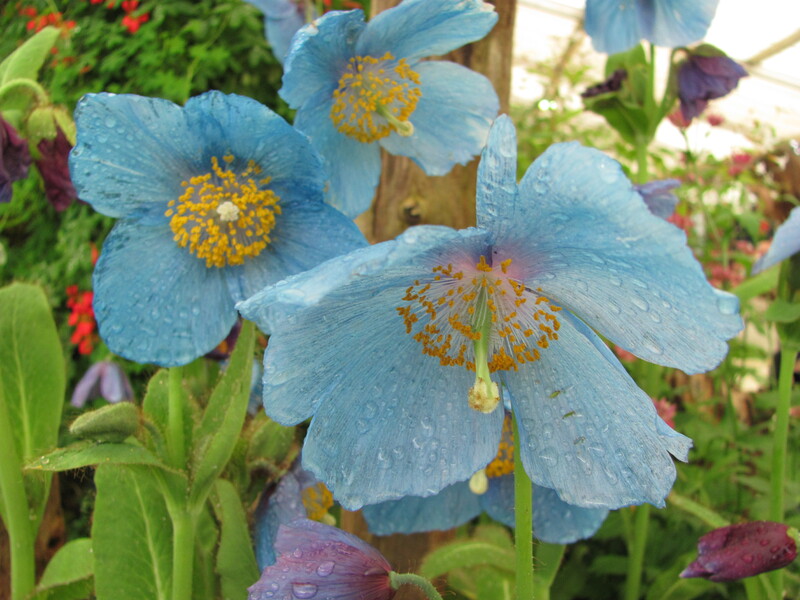 Never seen anything like your meconopsis–amazing. I have a meconopsis blog in the pipeline. The hot water bottle and toaster are genius! It makes you look at things differently doesn’t it?